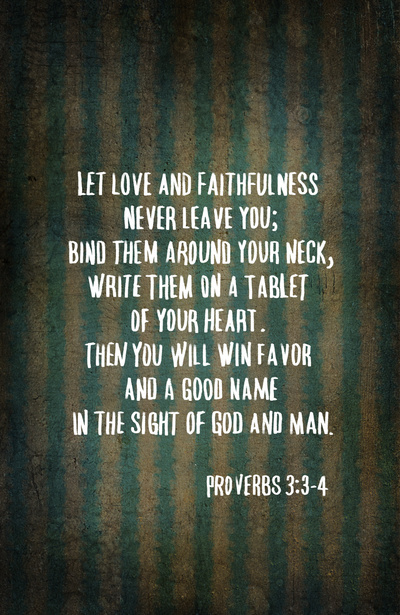 One of my favorite portions of scripture! I remember saying this over and over again… daily… expecting it to be so. I didn’t even know about an Amplified Version as I sat in that Baptist church; but that KJV was on point as far as I was concerned! Not because of the language, but because I allowed it to speak to my spirit! I used to visualize it as if I literally were putting mercy and truth around my neck, wearing them as a necklace, as a necessity for my everyday “wardrobe” in order for things to go well with me. My expectation was that by doing so, I would indeed find favor with God AND with man. So, it wasn’t because of me being “all that” that caused good things to come to me and my family, and it wasn’t because of me having such a huge amount of faith. It was because I was on purpose “wearing” mercy and truth and my faith was in the Word and what it promised. This is what was said about Jesus after he submitted to and obeyed his parents though he knew who he was and what he was sent to do. The humility and the willingness to continue to walk things out step by step, even though he knew that there were other things he could do, could say, that would bring to light concerning who he really was. He has just spent three days listening and asking questions of the elders, amazing them with how he was able to discuss the topics and how he understood so much at his young age. But the willingness to go through the stages, go through the process, walk things out… brought him favor with God. Using this as an example, I can readily “check myself” and get things back in the proper perspective. My job is to trust and obey and realize that by doing so I find favor with God! Sometimes God is trying to get us to go “back to basics” in some areas. We tend to get so deep and so technical and He’s standing there trying to tell us to keep it simple and just look into the Word, expecting it to work!